As a sporting community, it is our duty of care to ensure children are safe playing sport. That’s why Vicsport has developed brand new posters for your club/organisation to pin up on the walls to show that you support child safety in sport. Through the Vicsport website, there are three designs to choose from and available for direct download by following the links underneath each image. If you require a hard copy, contact the Vicsport office on (03) 9698 8100 to arrange postage. Click here to view and download the posters. You can red more about the Child Safe Standards on the Vicsport website, as well as information and resources on child safety in sport for SSAs and RSAs, clubs, leagues and associations. The Winter School Holiday Program will be held in the first two weeks of July 2018. We are currently seeking interest from sports clubs in delivering a one-off 90 minute session to primary school-aged children as part of the School Holiday Program. The program will be held in Tallangatta, Wodonga and Wangaratta. 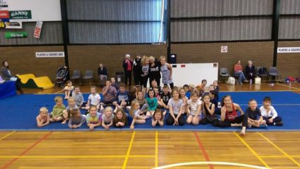 Sessions commence at 10am to 11:30am in Wangaratta and Wodonga, with a one-day session with three sports planned for Tallangatta between 9:30am – 3pm. The benefits for sports clubs can be promoting their club to the participating children and their parents, which can lead to increased engagement and membership for their club. If your club is interested in delivering a session for our School Holiday Program, speak to a Sport North East Project Coordinator today.